This has been a ongoing project for the past month or so on and off and I have finally reached the point where its working as it should . 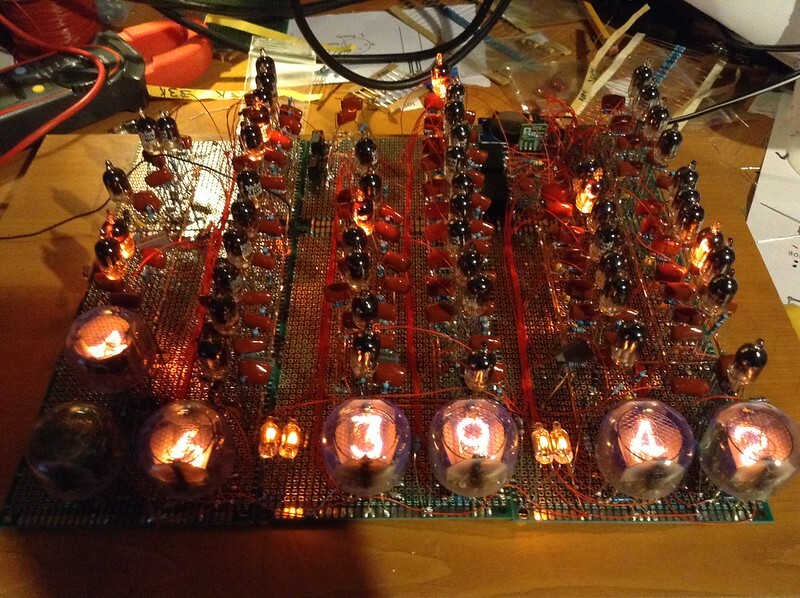 Its a 12 Hour Nixie clock using Z700U trigger tubes and front facing nixie tubes , AM is indicated by a A and PM is indicated by a V ( for now ) , Supply voltage to the board is 415V DC @ 20mA . Neon indicators between the hours and minuets are polarity switched using a relay to alternate the glow in the tube , Time keeping is done by a RTC module and Arduino to output a 1Hz drive signal that drives a relay and in turn drives the input to the seconds stage . Oh wow, that's a big load of discrete stuff to build a clock. Wow, all that glass..... beautiful! Ion, great work again...I didn't see this till now. You wouldn't have a cheap source of Nixies (UK Based) would you? or maybe you could flog me some, even secondhand ? Id say ebay is the best place that's where most of it came from , I would but don't have any other than the ones in the clock : P .
Hey Twirly, Reddit has a contest going for unconventional DIY clocks. Thought you might be interested. You can enter previously completed projects too! Thanks : D , I'll take a look at it .